Fig. 8.1. 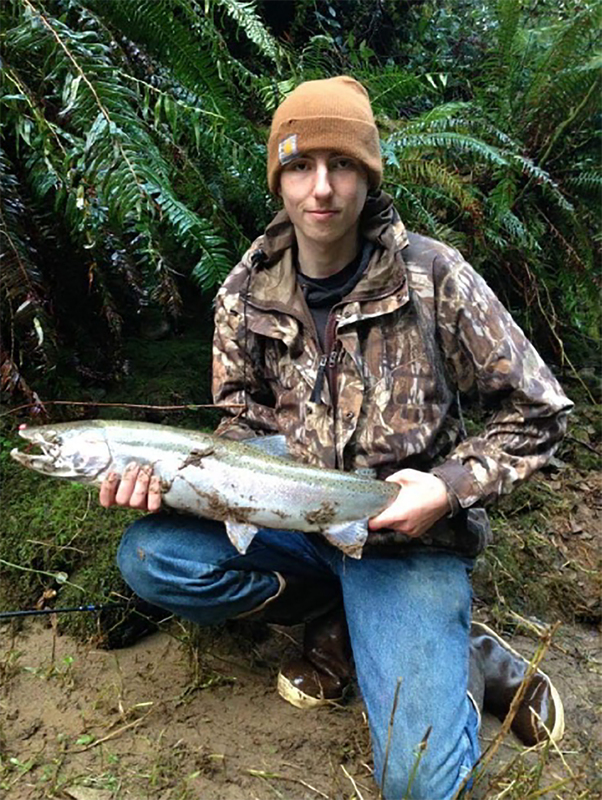 Max Richcreek with Steelhead. The Elliott state forest has approximately 40 large fish streams and a river. The west fork of the Millicoma River is the largest waterway in the forest, running north up the center of the forest. Aside from the West Fork of the Millicoma River there are 6 other basins that have large fish streams and small streams. Certain waterways in the Elliott are open to recreational fishing for trout and steelhead, such as the West Fork of the Millicoma. 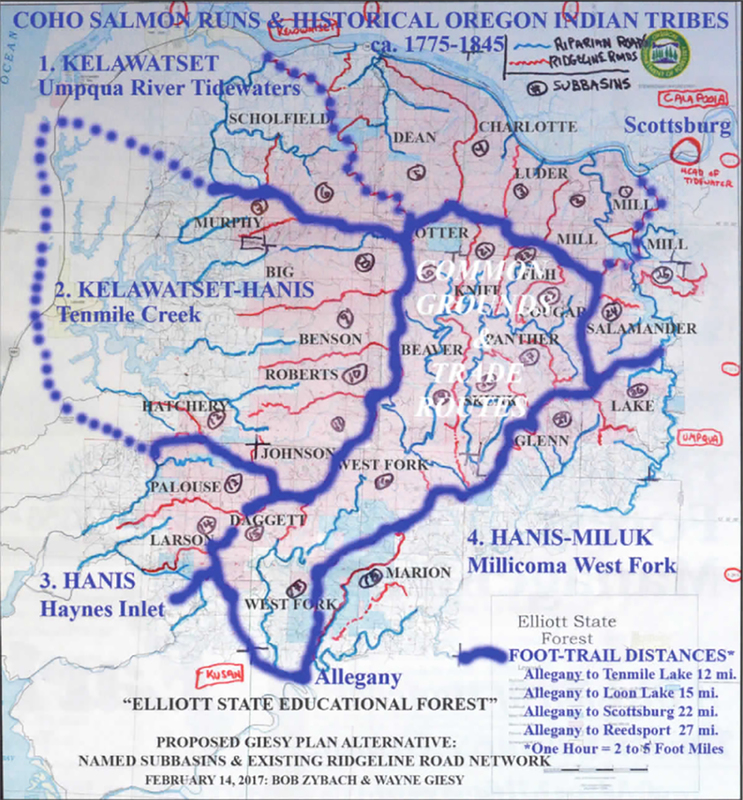 Throughout the Elliott there has been fish habitat restoration such as closing river crossings on the West Fork Millicoma, adding logs and boulders to Joes Creek, adding a fish ladder on Elk creek, and adding willows to stabilize the bank and slow sediment flow on Big Creek. Early on in the Forest’s history the logging techniques were destructive to the waterways. Spawning grounds were wiped out due to splash dams and massive amounts of sediment flowed into the river from bad logging techniques. Streams and rivers were also stripped of logs, boulders, and natural debris to allow logs to flow down the river uninterrupted. In recent history the state has begun to fix their previous mistakes in regards to fish habitat (Jerry Phillips, personal communication, May 14, 2018). They have added logs for habitat, gravel for spawning, and fish ladders for access. Also streams that were previously diverted have been set back to their natural course, such as Marlow Creek. Additionally, today stricter logging regulations have helped with sediment flowing into the waterways and keeping buffers on streams and rivers. Currently people use the Elliott for recreational fishing. Nearly all go the West Fork Millicoma Hatchery to fish (Antonio Salgado, personal communication, April 15, 2018). The number of people that fish anywhere besides the hatchery is very limited due to the remoteness of the forest and the limited fishing opportunities, although some do trout fish in the forest’s interior. Steelhead fishing past the hatchery is not as popular in the Elliott due to it being mainly native fish in that stretch of river, which you cannot keep. Nearly all the fishing access is along roads that follow the river or stream. There are no official trails or designated fishing areas in the Elliott besides the West Fork Hatchery/Girl Scout Camp. Small portions of the Elliott State Forest border the Umpqua River and Loon Lake. Unfortunately, where they do meet the terrain is mostly very steep and inaccessible from within the Elliott. Along Loon Lake there are no Elliott roads that meet the lake because of this, and the lake already has boat launches and easy access along the main road. At Huckleberry Point there is a very small isolated chunk of Elliott along the main Loon Lake Road adjacent to the Lodge, the land here is currently not being used. Along the Umpqua River where the Elliott meets it there is nothing except for the highway directly along the river. Outside of the Elliott there are multiple recreation areas/boat launches that border the river and Elliott. There is one way that money could be made of off fishing in the Elliott. Adding fish habitat costs money first off, but money can come from grants. With recreational fishing you could add a “fishing pass” that costed money to fish the Elliott, but this would extremely deter the fisherman that use the Elliott as there are many other local places to fish for free. Barriers to development are few. Federal and state agencies push for fish habitat restoration very hard, which means there are many grant opportunities. As for Fishing access in the Elliot there is not much that can be done. The west fork hatchery is established and by far the most popular fishing spot in the Elliott. Everywhere else in the Elliot that has fishing access is where the road follows the waterway. The only way to improve fishing access would be to add better spots to fish from the bank near the road, or add a trail along the river in spots. Much like the Girl Scout Camp fishing area. Map 8.1. Map of Elliott Native Fish Runs (Giesy and Zybach 2017: 6). I believe that the state should continue to improve fish habitat to help fish populations and make up for people destroying it in the past. As for fishing access I don’t think the state should do anything different than they are now. They should continue to keep the fishing at the Hatchery/Girl Scout Camp the same. Although if the ground at Huckleberry Point is flat enough the state could consider adding a boat launch, since most fishing in the lake is done by boat. As for everywhere else in the Elliott there already seems to be adequate fishing access. I also do not believe in a “Fishing Pass” for the Elliott, because I believe a fee to fish would deter the fisherman that fish the Elliott from returning.